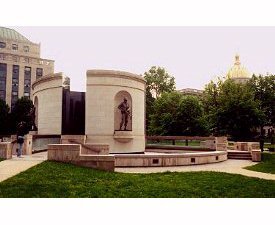 West Virginia: Montani semper liberi. 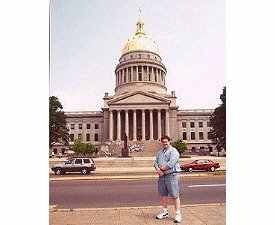 This was the second time I was in West Virginia. The first time was in November of 1995 when I was in the marching band and we all headed to Morgantown for the Rutgers-West Virginia football game. All I remember is that it was about 30 degrees out, we lost, and I had an asthma attack after the game. Oh, and that the band's #1 putz was telling everyone that Israeli Prime Minister Yassir Arafat had just been assassinated. Anyway, I returned in October 1999. 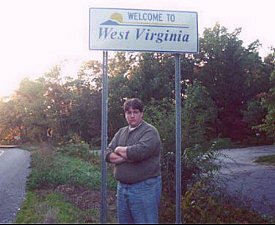 Since I was in the area wanting to check out Burkittsville, Maryland, on my way to Washington D.C., I figured I might as well pop into the tip of West Virginia's eastern "panhandle." Since Charleston was too far away, I merely concerned myself with the welcome sign. I found a good one on I-81 but it was just beyond the Potomac River bridge and either on a gantry or in the median and therefore inaccessible. I pulled off at a rest area where the local Boy Scout troop was having a safety break event/fundraiser. Grabbing a hot dog and a cup of lemonade and donating a few greenbacks, I took a gander at the map. I could have pressed on I-81 south across the panhandle where it crosses into Virginia, about 13 miles to the southwest. But then I figured that it was getting a little too late and too far out of the way and my friend who was expecting me at 5:30 would see me after 9. So I got on some local roads and headed east towards Harpers Ferry. At the three points area where Virginia, West Virginia, and Maryland meet, I could not find a sign. Now in Virginia, I figured that it would be a waste to give up on my West Virginia sign. I'm already here, right? With my trusty Rand McNally by my side, I sped down VA-287 past a bunch of cow farms from the northernmost point in Old Dominion trying to cross the border back into West Virginia at any other point. I was rushing since I was running out of daylight and wanted to get to Burkittsville, the town featured in The Blair Witch Project, before the sun went down. Not sure exactly how far down I had to go, and, running out of daylight, thinking that it would just be easier to get West Virginia when I finally make my first road trip west of Pennsylvania, I pulled off and debated whether to press on as a cow stared at me munching whatever it was he was munching. In the spirit of the quest, I continued, and wound up driving about seven miles south to the town of Mechanicsville, and then northwest on VA-9 about another three or four to the state line. So once I crossed into West Virginia I parked off to the side of the road in front of a couple of small houses. I took my picture and walked about 30 yards down the road into Virginia. I set up the tripod and stepped into a thicket of tall grass and I don't even want to think what else, and here I am. Looking back, it would have been easier to stay on I-81. Especially since this sign is on a country road and below the standard I have set for this project; thus I will have to retake it with a more prominent sign. I wound up getting into Burkittsville with about 10 or 15 minutes of ambient daylight left. I was watching some story they did on 20/20 about West Virginia and they did a helicopter fly-by of the capitol, so I knew it was along the river and had a gilded dome. I was driving south from Fairmont towards Charleston on my Cincinnati Road Trip. I-79 ends just north of Charleston and feeds into I-77. After about two miles, you run into I-64. There are no signs for the capitol, however. When you reach the I-64 interchange from I-77, you see the Charleston skyline off to the right, so you would naturally take I-64 west. And you would be wrong. Not only that, the next exit off of I-64 west of the I-77 merge is more than a mile away. I crossed the Kanawha River, took the first exit, and slowly meandered my way to the other end of town. I eventually got there and found a place to park. If I were to rank the capitols so far, West Virginia's would probably be number one. The only thing I would have liked better was if the complex was in the heart of downtown. Pretty much everything else that West Virginia could have done right was done right. The gilded dome is magnificent, as the south front of the capitol faces the Kanawha River. 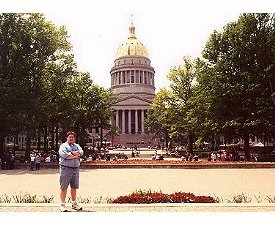 By the steps of the capitol on the south front is a statue of President Lincoln, who proclaimed the new state of West Virginia on June 20, 1863. The Battle-Born State is the only U.S. state to be created from the territory of another state. The north front is where it gets interesting. 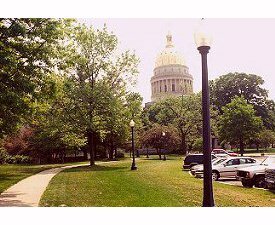 Walking around the west side of the capitol, I passed by the Governor's Mansion and the West Virginia Cultural Center and State Museum across the lush green lawns. 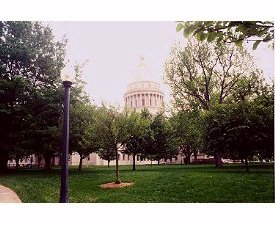 Many of the state agency buildings are located on the capitol grounds. I was in Charleston around 12:30 pm on a Friday. When I got around to the north front, there was a radio station doing a live remote. There were people mingling and enjoying their lunches in the hot sun. I don't know how many were state employees, but it just seemed to conjure up the ideal notion of the capitol being the place where the public could get together and meet. The grounds were laid out with great aesthetic care and seemed more like a park than a bunch of old office buildings. The capitol is a square-U-shaped building, with the area bounded by the three sides of the U on the north side containing a circular walkway with four radius paths meeting in the center. The entire plaza is tree-lined, and there is a stage area facing the open end. This picture was taken from the stage area. The Capitol was designed by Cass Gilbert, who was also the architect of the U.S. Supreme Court bulding in Washington, D.C. 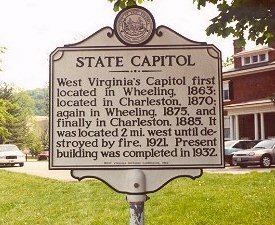 The capital alternated between Wheeling and Charleston for the first 14 years of West Virginia's history. Finally, in 1877, the citizens voted in a referendum to make Charleston the permanent capital, among the choices of Charleston, Martinsburg, and Clarksburg. Wheeling was not a candidate. The first permanent capitol was built in 1885 and burned down in 1921. A replacement was hastily erected, until the replacement capitol itself caught fire in 1927. 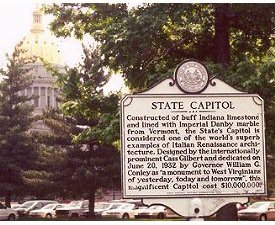 But by the time of the 1927 conflagration, construction on the current statehouse, which is actually in East Charleston, was already underway, and it was dedicated on June 20, 1932, the 69th anniversary of West Virginia's statehood. The dome is actually five feet taller than the U.S. Capitol's, and the three-year gilding process was completed in 1991. The exterior of the capitol is limestone, as are the Corinthian columns of the porticos on the north and south fronts. This page loaded in 2.582 milliseconds.